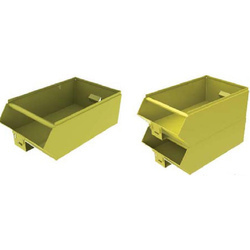 Providing you the best range of snout end bins and ms scrap bins with effective & timely delivery. Consistent innovation, coupled with an alert understanding of customer's needs & demands, makes us the most renowned manufacturer and supplier of Snout End Bins. Our offered end bin is manufactured using premium quality raw material and innovative technology in compliance with industry norms. We ensure that this end bin is offered to our clients after testing them against various quality parameters. Keeping in mind varied demands of our clients, we provide this end bin in different customized options at pocket friendly price. Scrap tipping Bins/ Scrap Bins are used to store insdutrial waste. It also comes with 2 tipping pins on either side, so that it can be operated by Handling Equipments.